Grant in the Glen & Big Bill's Ben. Let’s establish from the start that this was Deirdre’s choice. She assured us that, from memory, it was a perfectly straightforward wee hill. Finding the exact starting point can be difficult, but not today as we had a helpful pillar. Funny thing was that Dee couldn’t remember the ascent – she recalled it was through a forest; trouble was it had been felled since she’d last been there! We were soon on the open hillside, it was a cracking day; with good views to the summit ridge. It was 'Walkers' underfoot (crisp); glad we had winter boots! 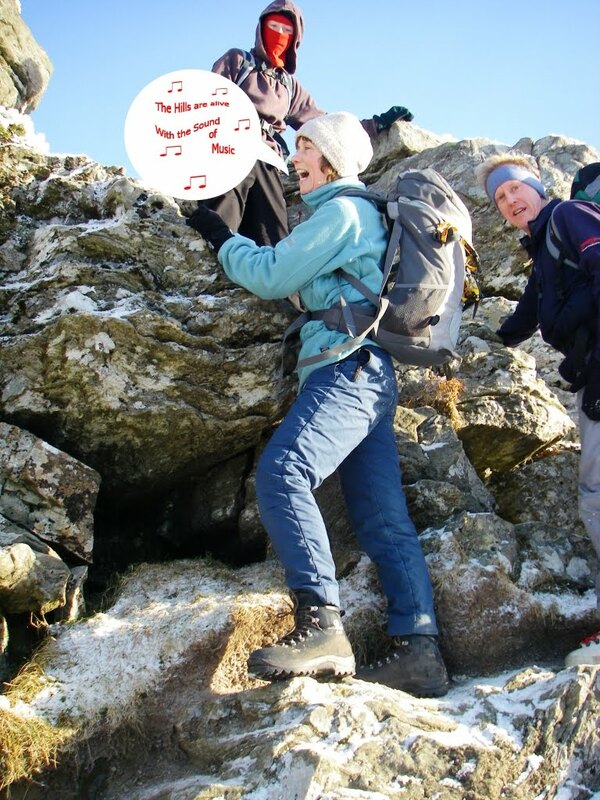 A short scramble down can be tricky, but Dee was so happy to be here she burst into song…. Beyond this is a short section of ridge made up of rocky blocks and clefts, then a steep section of path climbs up a grassy slope to reach the beginning of the summit plateau. The view over this area to Beinn Ime was grand. Overhead a high flying jet puzzled us; what prompted a ‘U’ turn? Did they forget something? It was cold and windy, but a beautiful day nevertheless. Grant mumbled incoherently through his balaclava; we began to suspect he was suffering from hypothermia, or was it just normal teenage speak? It was a short pleasant walk over the knobbly top leading to the cairn. Great viewpoint – for once we were in the right place at the right time. Father Andrew & son under a real St Andrews Cross. We reluctantly left the summit and sauntered back down the ridge. The new path makes for a fast descent. Enjoyable day out and a good choice for a first foot Deirdre!